Listen, women. It’s been a particularly difficult year. The assaults, insults, and violence towards women in this country and around the world have been devastatingly awful. Yet, the power, strength, beauty, and creativity found in women continues to rise. I’ve noticed women all around me, called by God, for purposes beyond themselves can’t be contained or shut down. Pastors, politicians, musicians, athletes rising, rising, rising, as they add love and justice and peace and beauty into the world. Earlier this year, I started a new church — it’s called Sunday Supper Church — because I had heard from God that this is who He made me to be, and that it was time for me to lean into my calling, and follow Him as He made something great. I felt unqualified, insecure, and scared. But God’s gentle voice reminded me day-after-day, that we were in this together, and that because He had made me to do this, He wouldn’t leave or forget to help me. Because when the call of God is clear, you can’t wait to start. You can’t wait for the day you don’t feel scared. You have to start scared. You can’t wait for permission, or for the negative internal voices to be silenced. You have to start without permission, while the doubtful voices continue to shout inside. You have to create and lead as God intended, because the world needs you and your unique, one-of-a-kind offering. Women, the world needs us to lead as God intended, specifically in this difficult time, to lead with strength and wisdom and compassion. To stand tall and proud while doing our thing, unwilling to turn back. As women, we might never have full permission to engage: in church, in our communities, in politics, or in the corporate world. But we’re going to lead anyway––overcoming withheld permission and our internal fears––because our permission to engage and lead comes from our Father. The one in whose image we are equally made. Because that’s the thing about women. They are brave and unstoppable, resembling their Maker. I thank God for this unquenchable, courageous spirit in women. If God has called you to do something—start a new church, open a business, start a family, travel the world, argue cases in court, train to be an elite athlete, do it! If you’re waiting for the right moment, enough money, everyone’s approval, the system to change, you’re going to be waiting a super long time. Don’t wait. Do your thing. I thank God for women. Strong, brave, creative, unstoppable women. Amy Dolan is Pastor of Sunday Supper Church, a new, table-based dinner environment in Chicago that seeks to gather diverse communities together for the sake of creating peace + justice in the city. No one in their right mind would apply for a job that had no vacations, no pay, and a workload that more than doubles around the holidays—especially a holiday in your honor. More than any other holiday, Mother’s Day evokes the full range of emotions in people. The propensity for a vast pendulum swing of sentiments is both deep and wide when it comes to Mother’s Day because mothering has so many different stages and phases. There are the mommas that are in their first few moments of mothering. They are new to the journey and deep down inside they are wondering will I ever sleep again. There are those wading in the choppy waters of the testing years of motherhood. You have colored many grey hairs and your knees are wobbly and skinned from praying that your children would find a path that leads them to wholeness and freedom. There are the single mom’s that are more than deserving of adorning themselves each morning in a super woman cape as they shoulder the responsibilities of being both parent and provider outside of a partnership. There are those rejoicing with vibrant and fulfilling relationships with their children. There are those mourning in the grief of a miscarriage, failed adoption, or loss of a child. There are those walking the desert road of infertility. Feeling alone and discouraged choking back tears at every other woman’s baby shower and birth announcement. There are the adoptive moms, foster moms, mentor moms, and spiritual moms that pull children into their hearts and homes and love them as their own. There are those who experience disappointment, heartache, and distance with their children and this day highlights and underscores the ever-present ache that you carry. There are those who lost their mothers…and the missing of their own Momma vibrates through their being. There are those who experienced abuse at the hands of their own mother—and they feel conflicted, challenged and even confused as to how to hold their range of emotions within their being. There are those who are single and long to be married and mothering their own children and they try to hold their head high on this day when their heart feels tender with unmet desire. There are step-moms, maneuvering their way through the intricacies of blending families together. There are those who placed children up for adoption that still hold that child in their hearts. There are those whose nests have become emptier and they are now steering a new ship with less cargo and the shift in weight has left them feeling unbalanced and uneven. There are many more categories and complexities and certainly not enough sections in the card department for all the different “mothers” in this world. Today on Mother’s Day, where we celebrate a job well done, a job that is often thankless & profitless and rarely deposits resources into our retirement funds. Let’s choose to celebrate one another instead of comparing one another. Let’s choose to delight in one another and the distinct ways in which we mother instead of disregarding our differences. Let’s sprinkle praise and blessings and encouragement on all mom’s everywhere instead of remaining silent and secluded. Let’s see and celebrate our children…. All children that we have the privilege to mother as sacred teachers sent from God that bring with them a spiritual curriculum to grow our souls to deeper levels of perseverance, character, hope and love. Here’s to you Moms, may you delight in all the beautiful benefits from this crazy job called MOTHERING. Jeanne Stevens is one of the lead pastors of Soul City Church in the dynamic West Loop neighborhood of Chicago, IL. Jeanne has had the opportunity to teach, pastor and speak in to the lives of thousands of people across the US and around the world. Her passion to develop leaders, encourage people to live from the fullest part of themselves and to live boldly give her a unique voice of hope and challenge. You can follow Jeanne on Instagram & Twitter – @JeanneMStevens and become her friend on Facebook – Jeanne Stevens. A few years ago, a dear friend gave me a book titled, Women Are Heroes. It is filled with beautiful portraits and stories of women around the world whose very existence is heroic. I flip through it often and I am constantly inspired by the resilience, strength and grace that women posses. You don’t have to look very far to find disturbing statistics about women across the globe. Women, on average, still make less than men. We are more prone to being victimized by sexual violence. We have less access to education. The list goes on. But somehow, despite all of the data, there are women who continue to defy the odds—fighting for justice in their communities, raising families with inadequate resources, building businesses out of nothing, and striving for educational opportunities to not only better themselves but the people around them as well. My line of work has afforded me the privilege of traveling all around the world and wherever I go, I am always in awe of the women I meet. I have visited with women in war-torn Democratic Republic of Congo. Women who have lived through atrocities of war and sexual violence against their bodies. But in spite of all they have experienced, they continue to work towards the healing of themselves, their own, and the healing of other women in their communities. 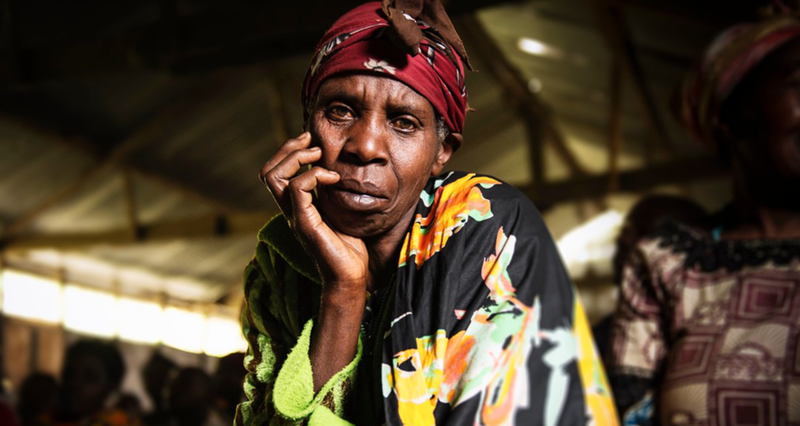 These women speak of forgiveness, hope and peacebuilding in their communities. I have listened to women in Kenya share how they started a savings group so that they could pay for their kids’ uniforms and school fees. They were soon able to start their own businesses, and then began to pay the school fees for other children in the community who were in need. I am surrounded by countless women—many whom I am honored to call friends—here in the United States who have committed their lives to advocate for those who suffer under the oppression of racial, gender, and economic injustice. When women are not allowed to fully express their God-given potential, it is affront to our Creator and a disservice to all of humanity. Throughout history, countless women have ignored the limitations that society has placed on them and fought, against all odds, for the opportunity to flourish. Women like Sojourner Truth, Harriet Tubman, Malala Yousafzai, Yuri Kochiyama, Berta Cáceres, Katherine G. Johnson, Septima Clark, the millions of refugee women around the world—the list goes on. These women have blazed trails, smashed ceilings, fought countless battles so that the next generation could dream bigger, soar higher and achieve things they never thought to be possible. The fight for women's rights means equal rights for all. Women work for the betterment of families, communities and nations. There is a deep understanding that we are all connected to each other and we all rise and fall together. So today—and every day—I thank God for women. The dreamers, troublemakers, peacemakers, bridge builders, trailblazers, ceiling crushers, and image bearers of the Creator. The women who see injustice in our world and refuse to stay silent. Those who work to infuse radical love and hope into our world. Women are heroes and I stand on the shoulders of the ones who have gone before me, and I link arms with the present day warriors. Together, we continue the fight for justice for all people. Chi Chi Okwu is a Senior Church Advisor for World Vision USA—working with churches and parachurch organizations to build strategic partnerships focusing on community development and relief work globally. She is passionate about issues relating to faith and justice specifically in the areas of race, gender and reconciliation, and enjoys speaking and writing on those topics. Chi Chi currently resides in Chicago and enjoys traveling, cooking, watching sports and spending quality time with friends and family. The Village Nearby is an chapter from The Mother & Child Project: Raising our Voices for Health and Hope—compiled by Hope Through Healing Hands’ Faith-based Coalition for Healthy Mothers and Children Worldwide. Deborah Dortzbach currently serves as World Relief’s Senior Health Advisor. Her extensive background in international public health has equipped her to oversee maternal and child health, HIV/AIDS, child development, adolescent health, and anti-trafficking programs for over twenty-five years. I thought I would deliver my firstborn child by myself in a makeshift lean-to on a windswept hill far from a health facility. I was terrified. There was no one to give me prenatal care. No one to coach me. No one to talk to about my fears. No emergency backup for complications. No one except…soldiers, hovering. I am a nurse and was taken hostage while pregnant by the Eritrean Liberation Front and held in a remote, desolate location near the Sudan border. One day, as I wandered in allowable short distances, I discovered others like myself in a nearby village. They were Tigre women, clustered around each other as they framed their nomadic huts. Some were pregnant; some had children tugging at their long, faded skirts as they stretched straw mats over simple poles. One woman stood alone. She had no children and looked sad and abandoned. The Tigre moms and millions like them, let us know that before us is a choice—to improve maternal health, or to actually increase maternal harm through just doing nothing. While we get genuinely interested for a brief season or for some project silos in maternal health, we all know the deeper issues of behavior and structural change take time and perseverance. Our commitments must be unswerving and unending. Fundamentally, as Christians, we work and strive to improve maternal health because it’s about valuing who a woman is as God made her and treasures her, not because of a role or function, marital status, maternal status, or even because of need, as great as that may be. Needs and resources will come and go—but the intrinsic worth of woman as God sees her, will always warrant our highest efforts to esteem her and fight for her equality and full expression of honor, dignity, safety, and health. The account in the Gospels of the bleeding woman healed by Jesus demonstrates this. The unnamed woman, bleeding for 12 years, was stigmatized, spiritually ostracized, extremely weak, and economically impoverished. Yet, drawn by the working of Christ in her life, she ventured into a crowded social space and touched Jesus. He cared so deeply and so thoroughly for her, that He allowed her blood-impure status to spiritually defile him. It instantly healed the woman. What a beautiful picture for us of the spiritual healing soon to come through the defilement Jesus took upon himself on the cross! God chose the body of woman through which to be born (Mary) and now the body of a woman to bring a foreshadowing of His healing power through death. Can there be any doubt He loves, treasures, honors, and redeems women and seeks to bring His redemption and completeness to all humankind in brokenness and suffering? Join us as we support those whose work raises the value of women and provides the opportunities for growth and progress. As a pastor’s wife in rural Kenya, Elizabeth Ewoton saw glaring financial needs all around her community. She decided to lead by example, using her influence to mobilize 15 local women to join a community savings group at Full Gospel Church in Lokitaung, Kenya, which had implemented World Relief’s Savings For Life back in 2014. Savings For Life is a holistic, community-based savings and credit program that offers safe and reliable financial services to people who are often excluded from more formal banking institutions. As time goes by, consistent savings allow participants access to appropriately-sized loans, without impossible fees and interest rates. This allows members of the group to take care of daily household needs and to establish and invest in their own income-generating activities. Prior to Elizabeth's involvement, no one had ever heard of working together as a community to save their own funds. But one woman, Hellen Esekon, caught Elizabeth’s vision and decided to give it a try. Both women’s families soon benefited substantially from the Savings For Life program, as each gained access to money to pay unexpected school fees for their daughters. Both Elizabeth and Hellen say there is no way they would have been able to pay the fees—which were demanded on very short notice—if it weren’t for the savings group. Elizabeth, who is now chair of the group, and Hellen have become bold advocates for the Savings For Life program at Full Gospel Church. They have experienced first-hand the transformation and security that comes with financial stability, and they want that experience for others as well! Give to World Relief to create a better world for women.